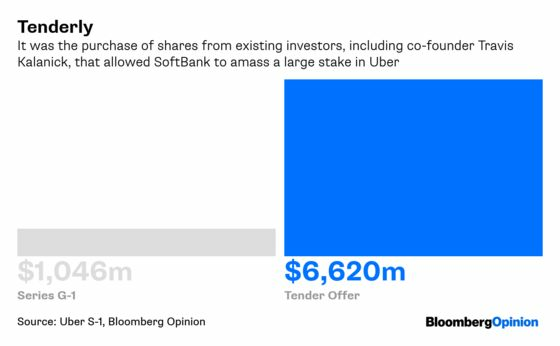 (Bloomberg Opinion) -- The SoftBank Vision Fund paid about $7.7 billion for its 16.3 percent stake in Uber Technologies Inc. A more important number is what Uber’s bankers can turn that into when the ride-sharing company IPOs on the New York Stock Exchange. Investors in the Vision Fund, and in Masayoshi Son’s listed SoftBank Group Corp., are rightly expecting a windfall. 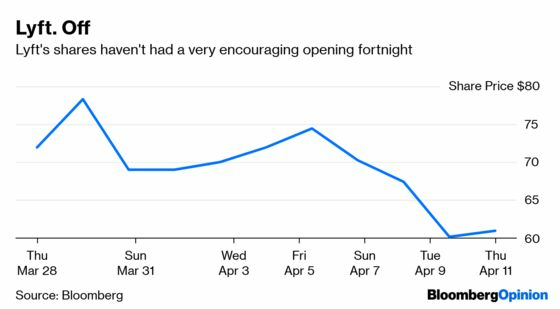 This will be the first big public exit for the $100 billion SoftBank-controlled fund. That also makes it the first chance for the Japanese billionaire to take a victory lap and put his naysayers back in their box. But he’ll have to hold his breath a little while. Uber’s actual IPO price will be largely irrelevant to calculating Masa’s eventual return on investment. All existing shares in Uber, including those held by the Vision Fund and other venture capital investors, are locked up for 180 days. Still, assuming the listing happens in the next couple of months and that the fund accounts for the shares on a mark-to-market basis, it’s possible that it will post a massive profit for the fiscal second quarter. But if the shares fall, losses would also need to be chalked up on its income statement. That might impact Tokyo-listed SoftBank Group. Lyft Inc.’s recent performance is not inspiring. After pricing its IPO at $72 on March 28, shares in Uber’s nearest rival have since slid 15 percent. 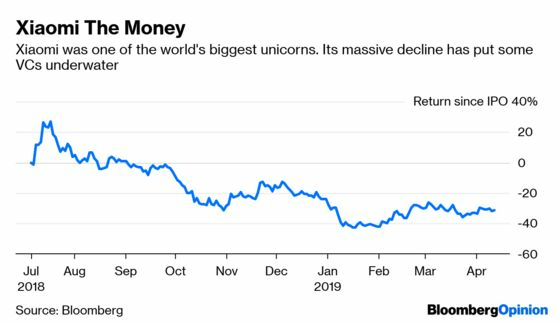 Unicorn IPOs haven’t had a great track record recently. Xiaomi Corp., once among the world’s most valuable startups, is down a third from its July market debut, while the food delivery platform Meituan Dianping has dropped 23 percent. Xiaomi’s story is particularly bleak for its later-round investors. Buyers of its Series F-1 preferred shares, the first tranche in the final series before its IPO, are now 27 percent underwater. Son opened his checkbook very late in Uber’s life, taking a stake less than 18 months ago and in the final rounds of equity financing. The Vision Fund paid $48.77 each for 21.5 million Series G-1 shares. Yet the savvy investor managed subsequently to leverage the internal turmoil at the company, and shareholders’ desire to cash out, to snag 10 times more stock at a significant discount. Chief executive and co-founder Travis Kalanick, who was pushed out because of concerns about his management, sold a big stake, as did long-time executive Ryan Graves and Google parent Alphabet Inc., as well as the VC firms Benchmark Capital and TPG and some other employees. All told, 243 million shares were sold in that tender offer, with Masa getting the lion’s share of 200 million at an average $32.97 apiece. That means his average cost is closer to $34.50 each per share, 30 percent lower than that G-series price. That latter transaction, and the lower aggregate cost, could prove crucial to the Vision Fund. Depending on the dilutionary effect of the new shares being issued in Uber’s public listing, the fund might remain in the black even if the company’s shares drop sharply after the IPO. If the shares stay flat or rise, then that late 2017 move to buy out Kalanick and other investors will pad out the returns on the fund’s investment. 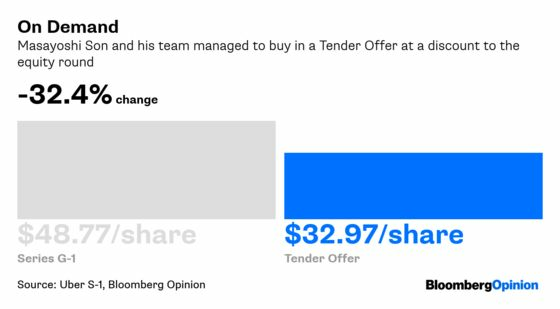 This would also give Masa more time to exit, which won’t be easy given that the Vision Fund’s 16.3 percent pre-IPO stake makes it Uber’s largest individual shareholder. Investors may take solace that Masa’s shrewd deal-making could soften the blow of any Uber decline or boost any gains, but they still need to bear in mind that he purchased a $7.7 billion ticket on a roller coaster that’s bound to have twists and turns. Tim Culpan is a Bloomberg Opinion columnist covering technology. He previously covered technology for Bloomberg News.